Ken began piano lessons at age five and sang in both the junior and senior choirs at his church. His musical development was typical for a musical teenager of the sixties; strumming guitar in a folk music trio and then playing his Vox Continental portable organ in several rock & roll bands. Ken discovered bluegrass while in college, and also renewed his affection for folk music by performing in the coffeehouse scene. He played keyboard in several country and western bands in the late seventies and then discovered Irish folk and traditional music in the eighties. 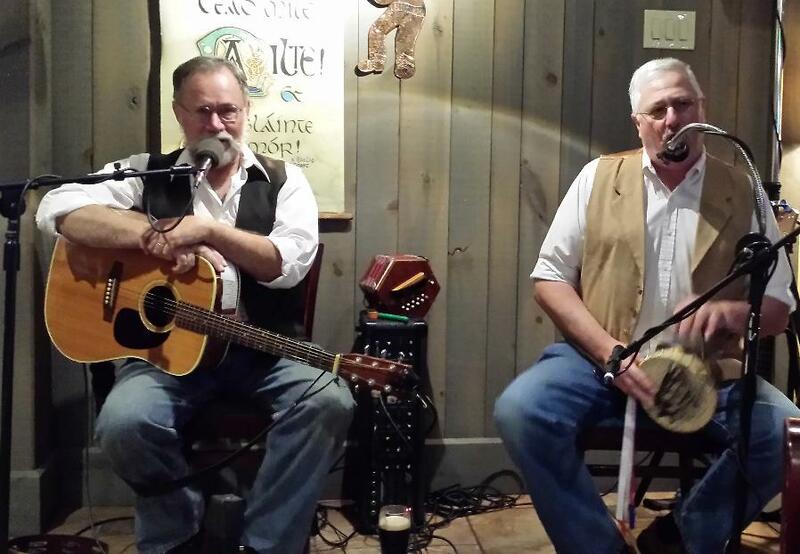 Although Ken still performs many genres of music, he has increasingly gravitated toward Irish music, music of the American Civil War and maritime music of the British isles. Beginning in 2002, Ken also performed with his youngest sons in their family band for several years until the boys struck out in their own musical direction. In 2011, Ken began playing with claw hammer banjoist, Jake Laubach, and in 2012 they began performing as the Jolly Roving Tars. Since launching the “Tars”, Ken and Jake’s distinctive repertoire, appearance and sound have taken them to varied ports of call, including a tall ship, a passenger rail car, maritime museums and numerous heritage festivals. Jake, a third generation musician, started playing clarinet in elementary school. Classically trained playing in school orchestras, concert and marching bands through high school, he also learned to play Sousaphone. Leaving classical and organized music behind, Jake taught himself to play claw-hammer banjo in 1978 and embraced folk music. During the 1980s, he picked woodwinds back up and played tenor and alto sax for a local rockabilly band. Excited by the new trends in electronic music, Jake then began playing synthesizer in a New Wave and Experimental Music group. Surprisingly enough, it was during this time that Jake revisited folk music and developed a love for singing Irish, Scottish and English ballads and folk songs. He often sang them, a cappella, while at work in a factory. Over time he was invited to sing at coworkers houses for small gatherings and at a local tavern. Jake began to perform at fireside while civil war reenacting in the mid 1990s. About that time Jake and Ken started working together in a pick-up band performing Civil War period music for Civil War roundtables and at a concert presented by Muhlenberg College. Since then Jake has amassed a respectable repertory of songs and tunes that span three hundred years and has added the fretless banjo, concertina, mandolin, the Hurdy Gurdy and other folk instruments to his musical arsenal.